I’ve made no secret of my love for Licor 43 (aka Cuarenta Y Tres) and I’ll be honest once more: This is one of the best cocktail’s I’ve ever tasted. Recently I went to Bar Blue and tried a little number called a ‘Saigon Sling’. In some ways they were similar, although overall they are totally different – I know, I know, it all sounds a bit contradictory but just stay with me here… The similarities lie in the use of 3 of the ingredients; Ginger Ale, Lemon’s & a form of sugar syrup (Saigon sling uses plain sugar syrup, whereas the Sweden Sangreal uses grenadine – pomegranate sugar syrup). This cocktail, one of a whole host of cocktails Licor 43 are presenting (a new one each month) is perfect for the summer, both sweet and sour with a touch of crisp ginger to top. The addition of fresh grapefruit just adds that little extra ‘zing’ the drink needs to make truly special. 1) Drop the lemon and grapefruit in the glass and muddle well, releasing the juices (and oils in the skin). 2) Add crushed ice, then grenadine and finally the Licor 43. Stir well, mixing up the fruit and ice. 3) Top up with a little more crushed ice and finally top with ginger ale. 4) Serve with a straw and a second helping (they’ll want another one). 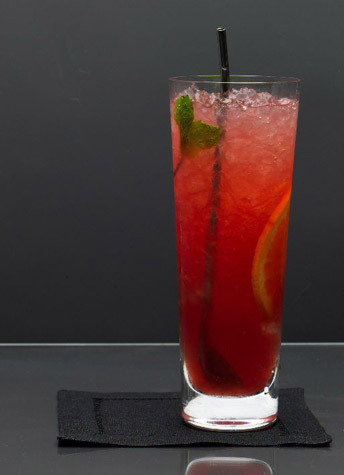 So have a go, it’s a simple cocktail to prepare, with the best results coming from using a good quality ginger ale as well as proper grenadine syrup. Licor 43 is one of those liqueurs that can cost a little bit more than the normal bottle of alcohol, but it will last a lot longer than your average bottle of Vodka (not to mention having infinitely more flavour). The best place to grab a bottle is here. Unfortunately I still cannot find a bottle for sale any of the supermarkets (should this change I’ll have a massive party to let everyone know!). Until that day enjoy it where you can find it! Adios Amigos!